TUV testing of dynaCERT�s HydraGENTM technology in Germany yielded proven emission reductions in NOx of 88%, CO of 50% and particulate matter of 75%, all while increasing fuel-savings up to ~20%, providing better torque, and lowering maintenance costs -- results which are unmatched by any other current technology. NOx is extremely hazardous to people's health and to the environment, contributing to the formation of smog and acid rain, as well as deteriorating the earth's protective tropospheric ozone. HG1 4.5T Unit & HG1 2.5T Unit targets diesel truck market & buses (class 6 - 8 engines). HG2 Unit targets refrigeration container & light truck market; dynaCERT's HG2 unit is set to hit dealers in Q2-2019 targeting initially refrigerated trailers. The HG-2 unit is smaller than the HG-1 units and conceivably can be expanded to service smaller trucks, buses and smaller trucks commonly found outside of North America, such as in European countries and in India. HG3 Unit targets large stationary power generator, marine, & rail market. (HG3 unit; 6,000hp - 30,000hp engines). Carbon Credits -- dynaCERT has initiated the world-wide process of Carbon Credit applications for its HG Technology and engaged International Environmental Partners Limited of the UK to assist the Company in this regard. Targeting 'off-grid' energy solutions; dynaCERT is leveraging its unique hydrogen production technology by marrying it with inputs from renewable energies (e.g. solar) to generate sustainable quantities of hydrogen to power fuel cell power stations (this program is currently in R&D with costs subsidized by grants). 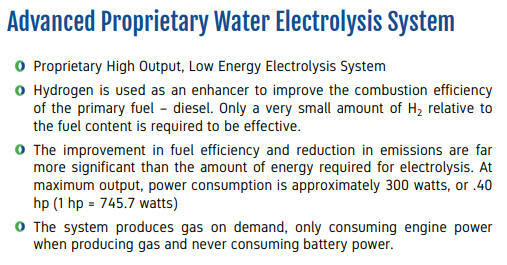 dynaCERT's HG technology was recently featured in Western Canada Highway News Letter - click to view [PDF]. Jay Taylor of Hard Money Advisors interviews Jim Payne, dynaCERT's CEO, regarding developments. Click here to listen to the February 5, 2019 interview which begins starting at the 17:30 minute mark. In the interview dynaCERT's CEO discusses how accelerated growth this 2019 will see the Company become cash flow positive, and more. Valuation Commentary: dynaCERT Inc. (TSX-V: DYA) (OTCQB: DYFSF) (Frankfurt: DMJ) shares appear at the beginning of a major upside move as the market has only started to price in the reality of the magnitude developing for its HG technology. A move toward a $1billion+ market cap in 2019 is not unreasonable, especially considering the Company's advances in establishing its technology for tracking and trading carbon credits (see related March 26, 2019 news release entitled "dynaCERT Initiates Carbon Credit Applications for its HydraGEN� Technology"). dynaCERT Inc. currently has a market cap of only ~C$87 million, miniscule compared to where the Company is headed; DYA.V�s valuation appears poised to rise dramatically as its HydraGENTM (HG) technology is increasingly being recognized globally as the single most effective and practical piece of equipment businesses and governments can adopt to meaningfully reduce greenhouse gases. In the later part of 2018 dynaCERT announced the results of official European TUV testing of it�s HG units, verifying emission reduction in NOx of ~55%+, CO of 50%, and particulate matter of 75%, all while saving fuel. TUV is facilitated by the Federal Motor Transport Authority in Germany which does testing in the EU, nothing can be installed on a vehicle without its testing and the subsequent ABE certification license. 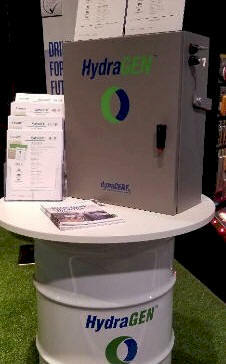 dynaCERT is expected to receive ABE certification soon, this will provide a significant catalyst for sales. 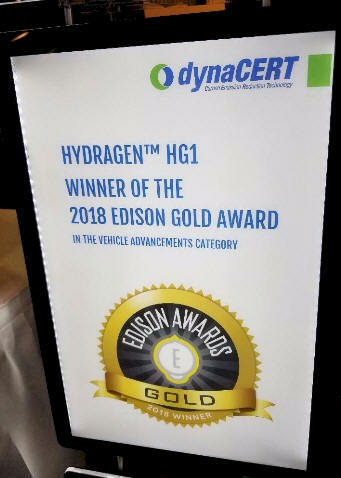 So impressive is the HydraGENTM technology dynaCERT is the Gold Medal winner of the prestigious 2018 Edison Award for Best New Product. Recent news such as the January 16, 2019 news of the Company achieving a milestone from the Government of India involving sizable initial orders from two of twenty nine government states, the December 20, 2018 decision by the government of Austria to proceed with a plan to equip all state-owned diesel-powered vehicles with HydraGENTM Technology, and the launching of HG technology for the mining industry with orders to service extra-large industrial equipment are examples of demand for the pragmatic greenhouse gas emission reduction solutions dynaCERT offers. They are the type of announcements this publication is anticipating to play-out with increasing frequency throughout 2019 from an array of institutions globally taking action on pollution. 10) Reduction of Diesel Particulate Filter (DPF) replacement period by at least 33%. Technology that pays for itself: Noteworthy excerpt from Sept. 24, 2018 release regarding results, "While the dynamometer test showed a 8.9% fuel savings, separately, during the on-road break-in period after the baseline test, the on-board diagnostic (OBD) record of the 2018 MAN TGX 18-460 long haul truck with an HG1-45B showed a 20.1% average fuel savings for the 188 hours of tests, travelling through the mountainous terrain of southern Germany in a heavy load commercial operation." 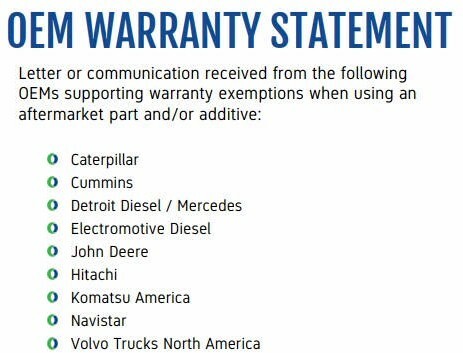 Currently engineers and senior management of dynaCERT Inc. are in ongoing communication with OEMs Mercedes, VW, ManTruck, Volvo, Freightliner and others. There is serious interest in dynaCERT�s HG technology as new European regulations VECTO for emissions reduction came into effect on January 1, 2019 requiring all truck manufacturers to provide full emission testing on every new vehicle model in various load and road configurations. These tests then become the baseline from which each vehicle sold in Europe built in later years must improve upon. As the trajectory for HG unit sales accelerates it won't take long for the economics to flourish, especially considering the healthy gross profit margins per unit and the fact there is a market with desperate need globally for millions of HG1 and HG2 units, capable of drastically cutting greenhouse gas emissions from diesel engines. Diesel engines are the lifeblood of all economies, and the size of the market potential is enormous with 100's of millions of diesel engines in use globally. Synopsis of HG technology and its Smart-ECU controller: dynaCERT�s technology is packaged into a small compartment that fits on the side of a truck. dynaCERT calls their units �HydraGEN� (TM) or �HG� for short. The unit interfaces with the truck engine�s computer and uses electrolysis to turn distilled water into pure (elemental) H2 & pure O2 gases (individually), produced and injected on demand to enhance the burn, drastically cutting harmful emissions, all while lowering fuel costs. This whole process is controlled by a smart-ECU (the brains of the unit) which can record the fuel savings and emission reductions while in operation, and provide an audit trail, essentially a greenhouse gas tracking system with the ability to account for future carbon credits. David Bridge, one of the original developers from Virgin Mobile, and also formerly of Research in Motion (known for the Blackberry), is the brains behind dynaCERT�s Smart-ECU. The CERT in dynaCERT stands for �Combustion Emission Reduction Technology�. With the ability to verify and log emission savings, dynaCERT is currently working with a group in the UK, experts on carbon credits, and is in the process of having the technology certified for carbon credits. Carbon credits are a huge commodity worldwide that is only just starting to catch on in North America. The plan is for dynaCERT�s Smart-ECU to monitor and eventually monetize carbon credits. dynaCERT has several related worldwide patents its CEO believes carbon credits will eventually be huge for both dynaCERT and the end users. See related March 26, 2019 news release entitled "dynaCERT Initiates Carbon Credit Applications for its HydraGEN� Technology". TORONTO, March 26, 2019 (GLOBE NEWSWIRE) -- dynaCERT Inc. (TSX VENTURE: DYA) (OTCQB: DYFSF) (FRA: DMJ) ("dynaCERT" or the "Company") is pleased to announce that it has initiated the world-wide process of Carbon Credit applications for its HydraGEN� Technology and engaged International Environmental Partners Limited of the UK to assist the Company in this regard. 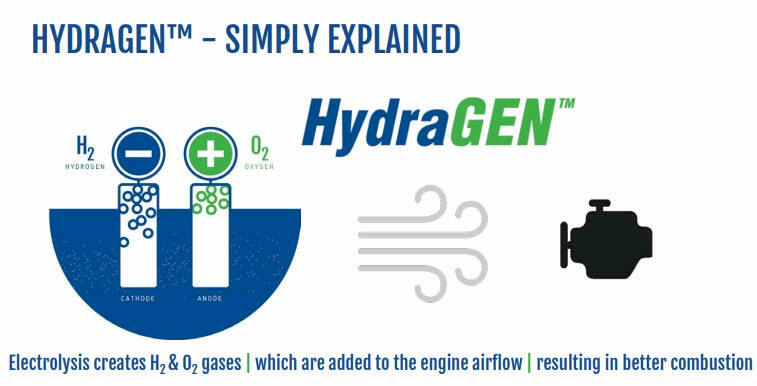 By reducing fuel consumption in diesel engines while at the same time reducing carbon emissions and other pollutants, the HydraGEN� Technology can become very lucrative with the global market acceptance of carbon credits. For example, it is estimated that a Class 8 Truck travelling long haul routes can generate up to �$1500 per year (Cdn $2278/year) in carbon credits based on the current market price of �15/tonne of CO2. dynaCERT�s goal is to create a world-wide programme to enable any earned carbon credits to be shared with end-users of its HydraGEN� Technology under a contractual subscription programme. 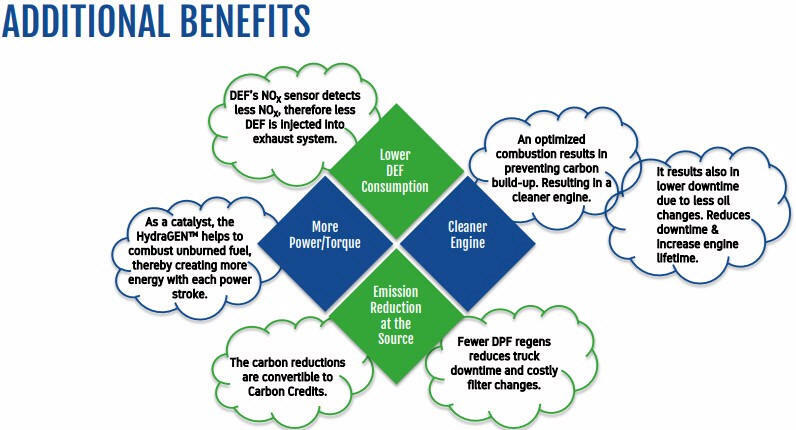 To our knowledge, the only existing methodology today to measure and track carbon credits from diesel engines is dynaCERT�s HydraGEN� Technology and our SMART ECU2 electronics and algorithms. 1- dynaCERT has created innovative proprietary software algorithms in its patent pending SMART ECU2 to track the creation of carbon credits, such as its �Systems and Methods for Tracking Greenhouse Gas Emissions Associated with an Entity� patent pending (see Press Release dated October 5, 2017). An International Patent application has also been filed. Mr. David Bridge leads the charge at dynaCERT in these accomplishments and continues to develop new electronic advancements related to our HydraGEN� Technology. 2- dynaCERT has nominated to its advisory board successful FinTech entrepreneur Brian Semkiw, P. Eng. and has more recently engaged his organization to further develop software that will enable the tracking of carbon credits generated by dynaCERT�s HydraGEN� Technology. In addition, Mr. Semkiw will oversee that such carbon credits be validated, audited and digitally accepted in international markets. (see Press Release dated March 1, 2018). Mr. Semkiw�s company, 3rdGP, is the world�s first third generation processing payments company with emphasis on Blockchain and IOT payments processing solutions. 3- dynaCERT today has entered into a contractual agreement with International Environmental Partners Inc. of the UK and its President, Ms. Monika Wojcik, to manage two key dynaCERT applications in the certification of the carbon reductions generated by its HydraGEN� Technology: (a) VERRA a highly recognized international certification organization based in Washington, DC for trading in the European marketplace where the trading of carbon credits is very active and which was been established as a major initiative of the Kyoto Protocol in 1997; and, (b) the Clean Development Mechanism (CDM) for developing countries which has been administered globally since April 6, 2007 by the United Nations offices in Bonn, Germany, and which bases its criteria as a result of an EU Directive 92/57/EEC (OJ L245, 26.8.92) in the Kyoto Protocol (see Press Release dated June 7, 2018). Ms. Monika Wojcik is a financial and environmental markets trader, sustainability advisor and passionate advocate for countering climate change and global warming. She advises global corporate clients and governments on carbon emission offsets, sustainability, and clean technology improvements and implementations. Before founding International Environmental Partners she has worked as a broker and trader for CF Partners and FXCM. International Environmental Partners is a carbon credit advisory and trading house with global outreach. Figure 1. New Pit Group Certified HG1 Unit (a - left above) installed on diesel truck, (b - center above) in polymer case, (c - right above) rugged case. As with any young technology there have been hiccups; marketplace resistance, certification, supplier issues, refinements, improvements, upgrades, etc... it appears all major hurdles are now behind dynaCERT. The Company's product evolution positions it as having something no one else in the marketplace comes close to in terms of competition or efficacy, uniquely positioning the Company for global sales growth at a time the world is increasingly aware of the need for solutions. The future is extremely bright for dynaCERT as the level of enthusiasm is building globally for an immediate solution to greenhouse gas related climate change and the dire need for clean breathable air. View video overview of dynaCERT's technology -- there are literally hundreds of millions of diesel engines globally that are candidates for this technology: Running time 3 min. 50 sec. Fig. 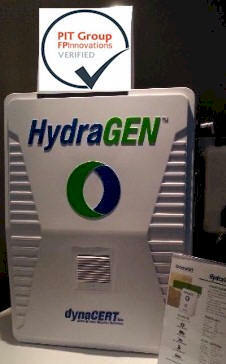 2 dynaCERT leveraging its new gold Edison Award at recent Truck World exhibition. dynaCERT has received notification of certification for India and South Asia markets from the International Centre for Automotive Technology (iCAT) for the use of its HydraGEN� Technology on diesel powered vehicles and equipment to reduce carbon emissions and fuel consumption. As reported in the MD&A dated June 30, 2018, and September 30, 2018, iCAT has conducted Phase Three testing of the HydraGEN� Technology. iCAT, a division of NATRiP Implementation Society NATIS Government of India, was established in 2006 at Manesar, Haryana, India. iCAT is a certifying partner with TUV Nord who conducted the homologation testing for dynaCERT in Germany. dynaCERT has received a Letter of Intent from Rajasthan State Road Transport Corporation (RSRTC) (please see web site http://transport.rajasthan.gov.in/rsrtc/), through its state partner Shah Transport Company, for the order for two HG145B units and, upon demonstration, an initial bulk order of 1,000 HydraGEN� HG145B units to be installed on buses and service trucks. RSRTC is the largest provider of intercity bus transportation in the state of Rajasthan, India, headquartered in Jaipur. RSRTC has been established by the Government of Rajasthan on 1 October 1964 under the Road Transport Act 1950. RSRTC has incorporated Ordinary, Express, Deluxe, A.G. Gandhi Rath, A.C., A.G. Sleeper, Volvo-Mercedes, Volvo-Pantry, Volvo-LCD, Volvo-LCD-Pantry bus services in fleets for all categories of passengers. It has 5,000 buses in its fleet and 56 service depots across the state. dynaCERT has also received a separate Letter of Intent from Uttarakhand Transport Corporation (UTC) (see web site http://utc.uk.gov.in/) for the initial order for two HG145B units and, upon demonstration, the further delivery of 1,200 HydraGEN� HG145B units to be installed on UTC buses. UTC is a public sector passenger road transport corporation providing services in the state of Uttarakhand, India and other adjoining states in North India. With a substantial fleet size of buses that operate over 350,000 kilometers and serve the travel needs of over 100,000 people every day, UTC provides an adequate, economical & efficiently coordinated road transport service to the residents of the state. Note: The India bus market is particularly noteworthy as the overall potential is enormous; the total number of buses in India alone exceeds one-half million diesel-powered vehicles. dynaCERT recently hosted hundreds of executives from the All India Motor Transport Congress (AIMTC), whose members manage over 10 million trucks and 5 million buses in the India market. The European regulations VECTO for CO2 reduction come into effect on January 1, 2019 (http://data.europa.eu/eli/reg/2017/2400/oj). This regulation will require all truck manufacturers to provide full emission testing on every new vehicle model in various load and road configurations. These tests then become the baseline from which each vehicle sold in Europe built after January 1, 2025 must achieve a 15% reduction in CO2. A further 5% reduction requirement is to be achieved by 2030. Vehicles that do not achieve these CO2 reductions will lose their regulatory approvals. The Head of Emissions Testing and Validation released the Test Data Results to management participating at the IAA. He stated emphatically, �We understandably struggled to justify how and why the HydraGEN� unit performs as this is simply new to our marketplace. This is a real and effective product.� While the dynamometer test showed a 8.9% fuel savings, separately, during the on-road break-in period after the baseline test, the on-board diagnostic (OBD) record of the 2018 MAN TGX 18-460 long haul truck with an HG1-45B showed a 20.1% average fuel savings for the 188 hours of tests, travelling through the mountainous terrain of southern Germany in a heavy load commercial operation. The current status of the Homologation ABE application is that all required testing has been completed and the HydraGEN� technology has passed all test points. Final reporting of the results has been submitted to TUV-NORD which will compile an overview report and submit such report to the Government Transport Ministry (Kraftfahrtbundesamt KBA) for final review prior to ABE certification. Once the ABE is issued, dynaCERT GmbH will be authorized to sell HydraGEN� units for use on vehicles across Europe. Robert Maier COO & Chief Engineer, states: �The successful German test results add credence for our HydraGEN� Technology. The positive response at the IAA increases our confidence in the viability and future demand for our product. The strict European regulations that are coming into place for CO2 reductions will drive the necessity for a innovative solution for which our HydraGEN� Technology will play a predominant role.�. Note: Multiple jurisdictional initiatives are gearing-up to slash commercial truck emissions in USA and Canada too (e.g. see related December-2018 news story �Premier Doug Ford aims to cut truck emissions with commercial 'Drive Clean' push" which specifically names dynaCERT as a primary beneficiary). Also of note: The Environmental Protection Agency on November 13, 2018 announced plans to place more stringent restrictions on pollution from heavy-duty trucks, in a move that won the Trump administration rare praise from environmental groups. Nearly two decades have passed since the EPA last updated its standards for emissions of nitrogen oxide, or NOx, that govern the nation�s heavy-duty trucking fleet. Two years ago, 20 state and local air regulators, backed by public health groups, petitioned the agency to revamp its regulations of NOx, citing adverse effects on health and air quality. Source: EPA website � Noteworthy as dynaCERT has proven emission reduction in NOx of 88%, CO of 50%, and particulate matter of 75% in heavy-duty trucks. Several HG1-45B units have been shipped and are being installed in Bangladesh, Brazil and India. Of significant note is dynaCERT�s Dealer in South Asia that has had many meetings in West Bengal and Bangladesh with authorities to begin verification trials on buses, transports, power generators and fishing vessels and with a view to implementing large orders backed by Export Development Corporation (EDC). EDC is a crown corporation owned by the Government of Canada and whose mandate is to foster international trade by supporting Canadian businesses to sell their products internationally throughout the world. As these installations are on older diesel technology engines that are typically Euro2 rated, the end-users are reporting to dynaCERT reductions in fuel consumption and improvements in engine power within a week of the start of use. dynaCERT�s Dealer in Brazil has met with local authorities whose mandates are strongly focused on carbon emission reductions. Several units shipped last month to Brazil are now installed on different machinery and transports. Of particular note is one logging truck operating at 10 kilometres per hour for a distance of only 50 kilometres per day hauling heavy loads, 40 tonnes of logs, which is already experiencing fuel savings. The first of its kind, the HG1-45-4C unit, is to be installed onto a 1.5-megawatt generator in the Middle East. It is currently in transit from Dubai to its final destination in a remote desert where it will be installed onto one of 12 diesel generators. The customer of dynaCERT�s Middle East Dealer, a very large industrial equipment manufacturer and operator, runs over 500 power plants in the region. This model HG1-45-4C unit is expected to be used throughout the Middle East on generators that power the requirements of small villages and oil-refining plants. Dyna CERT has been advised that every jurisdiction in the region is seeking cost effective and sustainable solutions, their primary focus being Carbon Emissions Reduction. Development of dynaCERT�s large engine HG-145-6C unit has passed through functional testing. The HG1-45-6C is targeted and appropriate for engines of 80 to 100 litres in size for commercial mining machinery, such as the CAT 797F Large-Haul ore truck. dynaCERT is now ready to ship its first of such units to a large gold mining operation in Northern Quebec. The first-of-type, the HG1-45-F unit, is installed onto a large combine in Western Canada for this year�s annual harvest. This HG1-45-F unit is expected to operate 24 hours per day for the next 2 months. Expanding into the potentially lucrative marine sector: This April-2018 dynaCERT announced it is pursuing Marine Classification Society Type Approval for its HydraGEN� Technology through Lloyd�s Register. Type Approval for hydrogen-on-demand systems does not currently exist for vessels. The turn around time for approval is expected to be near 1 year. In the interim, targets for valuation of dynaCERT Inc. surrounding its HG-1 units for trucking alone, assuming only nominal adoption of the technology point to significantly higher share price for DYA.V, and once marine classification approval is obtained dynaCERT will be well positioned to excel in the marine sector too. The math on sales potential is staggering; example: to outfit just one container ship could easily generate close to $1 million in sales (as opposed to something in the trucking market which is short of $10,000/ unit.) and there are >90,000 commercial cargo ships alone operating world-wide. From a pollution standpoint; just one container ship puts out the equivalent emissions of 50 million cars per annum [click to view related link]. The Company also eventually plans to expand into the large power generation market and rail market. Figure 3 (above). 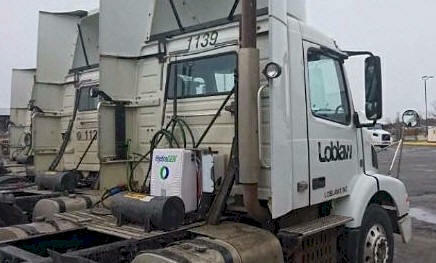 dynaCERT HG-1 unit on a Loblaw truck. The independent testing firm PIT Group has verified a 5.9% improvement in fuel economy and between 46.1% to 50% reduction in carbon monoxide, total hydrocarbons and NOx in straight line conditions. 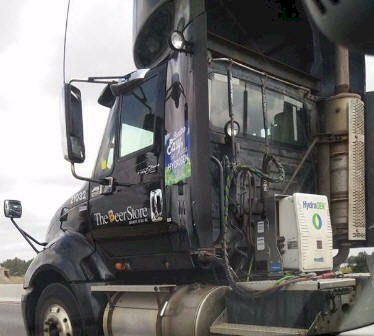 There are units now on the road yielding upwards of 19.2% fuel savings in real world conditions. These results simply cannot be ignored by such a major industry as trucking -- besides the motivation of good corporate citizenry, or talk in some jurisdiction of potential environmental legislation compelling action, certainly the ROI from improved fuel economy and maintenance cost savings provides more than enough economic incentive to acquire this product. In North America dynaCERT has reported global installations of its new HG1-45 models for diesel truck engines are �advancing very successfully�, mainly from small operations. The larger industry participants have been in a wait-and-see pattern, looking for another major to make the first move. Some very significant names (Loblaw, The Beer Store, IFS Logistics Freight Systems) have used dynaCERT�s HG-1 technology, mostly on a pilot-basis, and the reviews circulating within the industry from users are universally spectacular. This new technology is now percolating in a major way within the transportation sector, which appears only at the beginning of a massive adoption curve; these initial pilots/sales are expected to translate into strong expansion across entire fleets. What is different now is the truly global scale of the interest being generated of late, especially in places such as India which have major issues with air pollution. Real-world results to date are highly encouraging as clients attest to significant savings in fuel costs and reduction of harmful greenhouse gas emissions; e.g. User reports that its Class 8 trucks operating in the Toronto-Florida route achieving up to 17% fuel savings and 66% DEF reduction (source May 29, 2018 release). Figure 4. 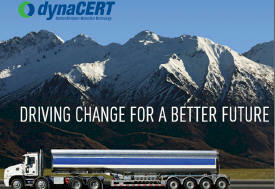 Example of branding 'DRIVING CHANGE FOR A BETTER FUTURE' gleamed from dynaCERT's company home page ( www.dynacert.com). dynaCERT's marketing and business council includes the former President of Cummins Diesel Canada and the former President & CEO of MEGA Brands joined dynaCERT. Both gentlemen joined dynaCERT in an advisory capacity ~mid-2017. The connections and pull within the industry these two individuals alone have are impressive. Entering 2018 their recommendations have begun being implemented and are expected to translate into significantly increased market awareness within the industry. The January-2019 addition of Mr. Frank Klees to dynaCERT's advisory board is expected to help accelerate adoption of HG technology in the commercial sector within Canada. Mr. Klees was a Progressive Conservative Member of the Legislative Assembly of Ontario from 1995 to 2014 where he held numerous important positions including Minister of Transportation, Minister of Tourism, Chief Government Whip, Deputy House Leader, Vice Chair of the Select Committee on the Proposed Transaction of the TMX Group and the London Stock Exchange Group. 2004 - Started as Dynamic Fuel Systems Inc.
2004 - First JetStar unit produced gas. 2009 - Introductory sales generated to First Adopters. 2010 - Developed Patent Pending separate gases provide unique characteristics. 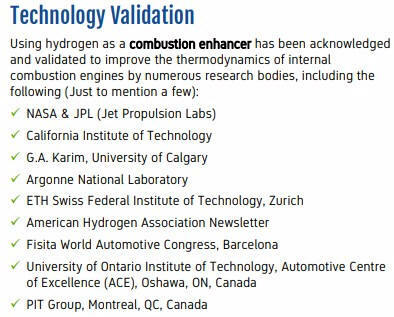 2012 - Dynamic Fuel Systems becomes dynaCERT Inc.
2016 - 3rd party validation from UOIT confirmed the performance of HydraGENTM technology. 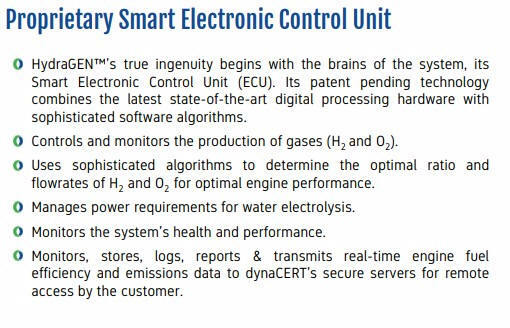 2017 - Developed Patent Pending "Smart" Electronic Control Unit (ECU) - the brains of the HydraGENTM. 2017 - PIT Group confirmed Emission Reductions and Fuel Efficiency. 2017 - Shipping the HG1 product to customers worldwide. 2018 - All-new HG1 4.5T Unit launched in April for 10 to 15 litre turbo diesel engines. 2018 - HG2 unit targeting refrigeration container & light truck market -- planned launch. 2018 - European homologation. Tests were conducted under the requirement for Homologation to obtain an Allgemeinebetriebserlaubnis (ABE), the German Transport regulatory license that is required for any equipment used on on-road vehicles in Europe. ABE expected to be finalized near-term. dynaCERT was effectively rebooted and rebranded in the latter part of 2017 after a trying year for dynaCERT; 2017 started off well with purchase orders and the Company started shipping well, however it discovered a problem over that summer and worked with its old supplier to identify the issue. The problem turned out to be the circuit board (supplied to dynaCERT), and the resulting recall/fix caused havoc with client goodwill after multiple versions of rectifications. That problem caused the Company to miss the opportunity to grab ~US$70 million in sales. dynaCERT was essentially in damage control and reputation repair. dynaCERT started reputational repair in 2017 by seeking PIT Group certification, which formed the cornerstone/start of dynaCERT 2.0. -- since then there has been no issues. � April 11, 2019 "dynaCERT Targets Underground Mining with Original Equipment Manufacturer, Total Equipment Services Inc.". � April 11, 2019 "dynaCERT Secures its First Ontario Trucking Fleet Order". � April 9, 2019 "dynaCERT Patent Granted". � March 29, 2019 "dynaCERT�s International Participation in Trucking and Technology Shows". � March 28, 2019 "dynaCERT Selects Geewadin Elliott as First Nations Liaison". 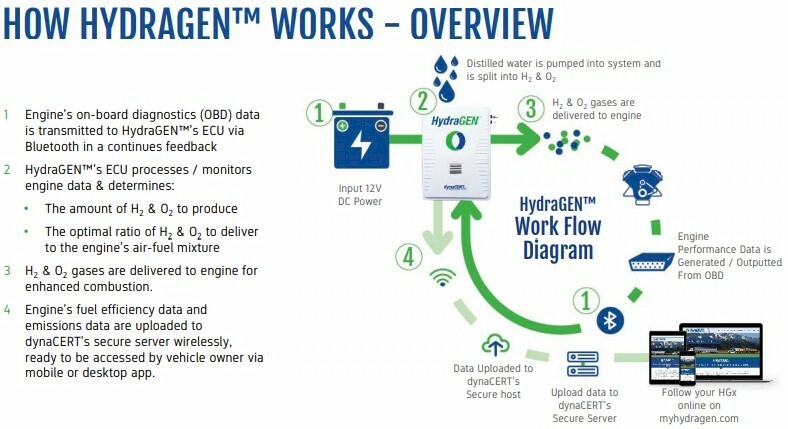 � March 26, 2019 "dynaCERT Initiates Carbon Credit Applications for its HydraGEN� Technology". � March 22, 2019 "dynaCERT and H2 Tek Nab Top Prize at the 2019 Mining Cleantech Challenge". � March 22, 2019 "dynaCERT Continues to Strengthen its Advisory Board". � March 12, 2019 "dynaCERT Selected as a Finalist to Present to Colorado�s Mining Cleantech Challenge". � March 7, 2019 "dynaCERT Appoints Amir Farahi to its Board of Directors". � March 1, 2019 "dynaCERT Announces Appointment of Brian Semkiw to its Advisory Board". � February 25, 2019 "dynaCERT Announces Over-Subscribed Offering and Closing of $5,250,000 Private Placement". 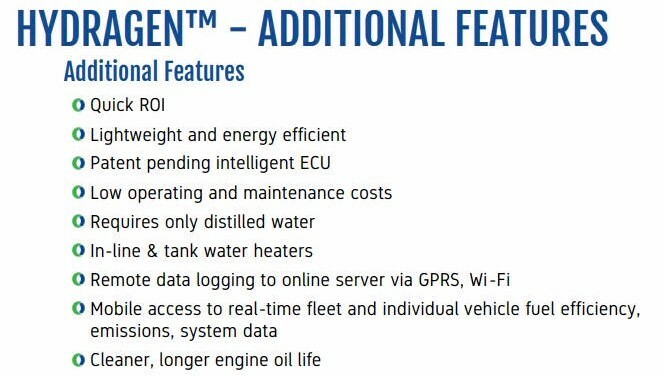 � February 4, 2019 "dynaCERT Launches HydraGEN� Technology for the Mining Industry". � January 31, 2019 "dynaCERT Continues Innovation and Development of Intellectual Property Globally". � January 30, 2019 "dynaCERT Announces First Annual International Sales Conference". � January 24, 2019 "dynaCERT Appoints Mr. Frank Klees, Former Ontario Cabinet Minister, to Advisory Board". � January 16, 2019 "dynaCERT Achieves Milestone from Government of India". � December 28, 2018 "dynaCERT Provides Corporate Update". � December 20, 2018 "dynaCERT Receives Commitment from Government in Austria". � December 19, 2018 "dynaCERT Comments on Ontario�s Environmental Plan and Provides a Corporate Update". � December 4, 2018 "dynaCERT Announces Completion of Oversubscribed Offering". � November 27, 2018 "dynaCERT Announces Offering Amendment, Proposed Oversubscribed 2nd Tranche Closing and Warrant Amendments". � October 19, 2018 "dynaCERT�s HydraGEN� Seen as Ground-Breaking Technology in European Diesel Market". � October 1, 2018 "dynaCERT Comments on Ontario Drive Clean Program Redesign". � September 24, 2018 "dynaCERT Updates on IAA Commercial Vehicle Trade Show". � September 24, 2018 "dynaCERT Offers a Solution to 2019 European CO2 Regulations". � September 21, 2018 "dynaCERT Announces $1,000,000 First Tranche Subscription of Brokered Private Placement". � September 18, 2018 "dynaCERT Announces Brokered Private Placement". � September 17, 2018 "dynaCERT Continues New Global Installations and Significant Progress". � August 16, 2018 "dynaCERT Provides Updates on Homologation and Product Launch in Europe". � June 21, 2018 "dynaCERT Announces New HG145 Orders and New Dealers". � June 7, 2018 "dynaCERT Announces Updates, New Orders, New Equipment Received for HG-2". � May 29, 2018 "dynaCERT Announces New Orders, Repeat Business and Real-World Results". � May 11, 2018 "dynaCERT Official Launch of HydraGEN� Technology in Middle East". � April 20, 2018 "dynaCERT Exhibits at Toronto�s Truck World Show and Closes Oversubscribed Final Tranche of Equity Private Placement". � April 12, 2018 "dynaCERT Receives Top Gold Award in 2018 Edison Awards for Vehicle Advancements". � April 10, 2018 "dynaCERT Expands its Dealer Network in the Middle East with Mr. Maheboob Nagji and Closes Second Tranche of Equity Private Placement". 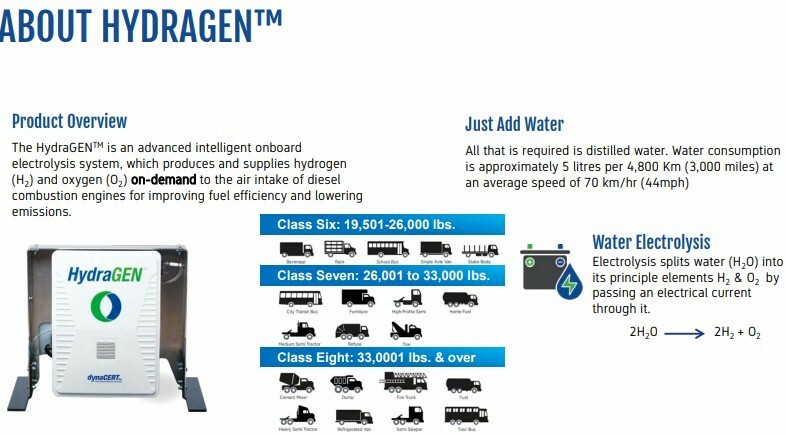 � March 5, 2018 "dynaCERT Official Launch of HydraGEN� at TRUCKWORLD 2018". � March 2, 2018 "dynaCERT Provides India, Europe and Corporate Update". � February 27, 2018 "dynaCERT Provides Update re India Matters". � January 31, 2018 "dynaCERT Appoints Colonel Yalon Farhi as Director, Provides Corporate Update Including Equity Financing and Note Redemption". � December 21, 2017 "dynaCERT Receives Initial Order for Europe". � December 4, 2017 "dynaCERT Honoured by Attendees at India Congress". � November 29, 2017 "dynaCERT Inc.: PIT Group States �Test Results to be Envied�". dynaCERT has two HG-1 lines; 1) an all-new HG1 4.5T Unit (which was officially launched on at TruckWorld this April-2018) for 10 to 15 litre turbo diesel engines such as for the Class 6-8 truck market, off-road equipment & power generator market, and 2) its original HG1 2.5T Unit for 5-10 litre turbo diesel engines which lends itself mainly to smaller trucks such as used in many overseas countries such as India and smaller diesel-powered machinery. The HG units use a smart-ECU to interface with a trucks diesel engine computer and regulates the injection on-demand of pure elemental hydrogen and oxygen (produced by the HG unit). dynaCERT's HG2 HydraGEN� technology, which is set to be launched soon (planned for Q2-2019), has a market that is multiples larger than for the HG1 product. The HG2 series are smaller in size and are targeted for the refrigerated trailer market (refer units) with engines up to ~2.5 L displacement. The HG2 units are also applicable to mobile construction equipment, class 2 � 5 delivery trucks and smaller stationary generators. This market size represents approximately 20 million applications in North America and similar sized market opportunities in each of the European and Asian markets. Each refer unit has a 4 cylinder diesel engine inside them that runs 24/7 to produce the refrigeration. Independent, PIT Group, testing of the refer HG-2 units are highly favorable, see related November 20, 2017 Company release "dynaCERT Releases Verification of its Advances in Reefer Engine Performance"; results confirmed: Fuel Consumption from 4.6 lb/hr to 3.5 lb/hr or 25% reduction, NOx from 150.5g/hr to 105.8g/hr or 30% reduction, Carbon Monoxide (CO) from 156.9g/hr to 77.5g/hr or 51% reduction, Carbon Dioxide (CO2) from 1713.2g/hr to 952.8g/hr or 44% reduction. Production and Growing Capacity - Production of the different HG1 series models is underway with the current capacity to build HG1 units at 6,000 units per month. Production of the HG2 series models is soon to be operational and dynaCERT is expecting to receive the specialized robotic laser-welding equipment that is being manufactured in Germany to facilitate production. Future capacity to produce HG2 units is planned to reach 10,000 units per month. Dealers and Agents � Extensive Network - The Company currently has numerous dealers and agents servicing countries globaly including Canada, USA, Mexico, Germany, Belgium, Austria, Switzerland, Israel, Brazil, United Arab Emirates, Saudi Arabia, Dubai, Egypt, Kuwait, Bahrain, Oman, Qatar, Bangladesh, Bhutan, India, Myanmar, Nepal, Pakistan, Sri Lanka, and UK (see dealer page at dynaCERT here). Initiatives and mandates to reduce harmful emissions are coming into place in numerous countries that will directly benefit dynaCERT near-term. In November-2017 dynaCERT received 3rd -party validation from the highly accredited PIT Group, considered the gold standard in automotive technology testing; testing verified that the HydraGEN� HG1 unit reduced emissions of CO by 48.1%, THC by 50.0%, and NOx by 46.1%, all of which exceeded the dynaCERT's own estimates. Also in the PIT Group testing a ~6% fuel savings was verified on a long straight flat run; fuel consumption was reduced by 5.9% when the test truck was run at a constant speed of 105 kilometres/hour for 100 kilometers on a flat track. Important to note is that dynaCERT has been able to verify even higher fuel savings in dynamic conditions (e.g. simulating city and hilly environments); the HG technology has the ability to alter the flows of H2O2 and control reductions in fuel consumption as high as 19.2% (as verified by independent scientists from the Automotive Centre of Excellence (AEC) at the University of Ontario Institute of Technology). 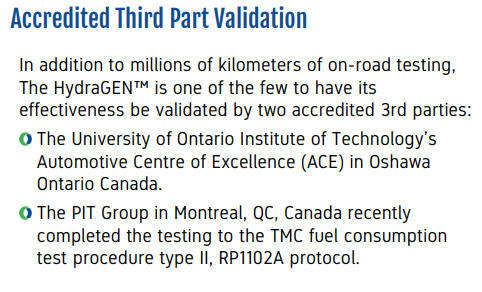 Independent scientists from the Automotive Centre of Excellence (AEC) at the University of Ontario Institute of Technology, were engaged by dynaCERT in cooperation with the government to verify what the Company has already demonstrated on diesel engines in the field; a proven reduction of toxic gasses within the emissions by 30% to 40% all while improving fuel economy of ~10% to 15%. The lab was also tasked with helping to establishing the carbon-credits that businesses qualify for by purchasing and employing the technology. Former Cummins Eastern Canada President, Mike Christodoulou (a member of dynaCERT's Advisory Board) stated, "I spoke directly with PIT Group representatives who claimed they had not seen these kinds of numbers in previously tested aftermarket technologies and that dynaCERT's results would be envied by other fuel improvement and carbon reducing technology providers." With win-win supply/demand metrics in play now, along with the proprietary nature of its technology, plus the barriers to entry extremely high from a validation hard-data and reputational standpoint, DYA.V appears poised to handsomely reward shareholders establishing a long position now. *Projections, estimates, and assumptions herein are based on journalistic opinion, not Company guidance. dynaCERT is positioning itself to become a world leader in research and development of hydrogen based technology solutions and is achieving this through non-dilutive government funding. Falling costs in solar, rechargeable lithium-ion batteries, and fuel cells are at a point in time whereby the confluence of all three technologies into an affordable, viable, coordinated fashion is a technology whose time is here to �cut-the-cord� for potentially millions of homes in the future and offer standalone solutions. Figure 1. 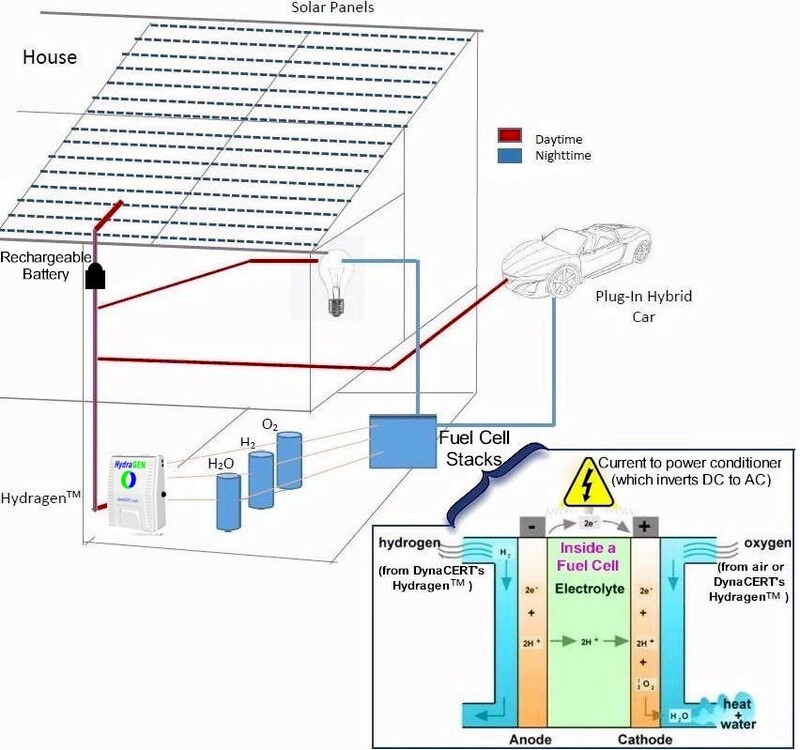 (above) dynaCERT 'off-grid' power solution diagram with close-up view of how a fuel cell functions. Solar panels and/or the hydrogen fuel cell will power the building by day using an energy optimization software. At night, the rechargeable batteries would then take over and activate the Hydragen� unit which will keep the hydrogen fuel cell operating by providing the required hydrogen gas. The solar panels would also maintain the rechargeable batteries at full capacity until they are needed at night and the cycle repeats itself. Further, the pure oxygen which is also produced by the Hydragen� unit would be used to improve the air quality in the building. Hydrogen gas (produced by dynaCERT's HydragenTM) is delivered to a negatively charged anode on one side of the cell while oxygen is channeled to a positively charged cathode on the other side. At the anode, a catalyst (often involving platinum) knocks the hydrogen atoms� electrons off, leaving positively charged hydrogen ions and free electrons. A membrane placed between the anode and cathode only allows the ions to pass through, and the electrons must travel along an external circuit � generating an electric current. At the cathode, the electrons and the hydrogen ions combine with oxygen to make water, which then flows out of the cell. For the last couple decades players in fuel cell power generation sector have been involved in ongoing R&D focused on reducing cost and improving durability with the goal of eventually leading to mass commercialization/acceptance. Only a few years ago the industry experienced hydrogen fuel cell costs around $1,000 for every kilowatt of power they generated, now that cost is nearer $50 and expected to drop significantly further with technology in the pipeline (e.g. platinum-nickel alloys as catalysts (Lawrence Berkley Laboratories), and platinum with carbon silk (Ballard Power). Fuel cell technology is now at a point where in the near future, fuel cells are expected to increasingly replace conventional furnaces and electrical power utility reliance, providing homes and offices with heat and electricity, free from the disruptions associated with the utility's electric grid. Technological improvements and economies of scale associated with rechargeable lithium-ion batteries and renewable energies (such as solar) have led to lower costs/increased affordability for those technologies too, and this trend is projected to increase also. In-short, the cut-the-cord type system that dynaCERT is advancing which entails a confluence of solar, rechargeable batteries, hydrogen fuel production, and fuel cells in an affordable, viable, coordinated fashion is a technology whose time is here. 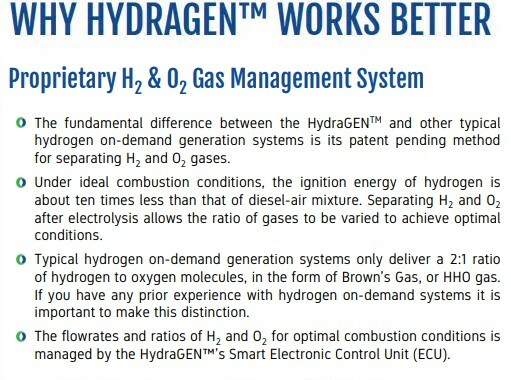 � Central to the off-grid power system is dynaCERT's HydragenTM: dynaCERT is uniquely positioned with an established, proven, and reliable product capable of generating pure hydrogen and oxygen individually in a timed fashion; its 3 L/minute Hydrogen unit currently in service (in the trucking industry) is able to generate voluminous amounts of pure hydrogen, and the technology is scalable, able to generate amounts for multiple larger scenarios. The Company's up-to-300 L/minute Hydrogen unit, such as the one it used on a Wartsila engine at a utility in the Caribbean, is testimony to the Company's ability to consistently, reliably, and safely deliver pure hydrogen on demand. � Capitalized for success: The Company has stated it is the beneficiary of the push to see Canada reduce its carbon footprint; dynaCERT's May-2016 new release stated "It is an opportune time for dynaCERT to capitalize on this commitment to reduce carbon emissions and to access the Canadian and Ontario government grants and loans. As such, dynaCERT is positioning itself to become a world leader in research and development of hydrogen based technology solutions and receive available non-dilutive government funding." � dynaCERT's off-grid power generation project is spearheaded by highly-skilled and accomplished individuals: Dr. Richard L�, an independent director at dynaCERT, has more than 20 years of global experience in the energy industry. Dr. L� has been involved in managing public listed companies in the area of silicon production, solar cell manufacturing and solar panel production. He has led many initiatives in energy conservation, demand response, distributed energy and other sustainable developments. Dr. L� heads a major solar power company developing and operating solar PV projects in Canada and the USA. Dr. L� is working alongside Dr. Richard Bower, a physicist and solar energy expert. Mr. Jim Payne is Chief Executive Officer, dynaCERT Inc. Mr. Payne also serves as Chief Executive Officer of his privately held consulting, project management and real-estate development company operating in the GTA and surrounding areas. Mr. Payne graduated from St. Clair College in Construction Engineering, Project Management and Estimating in 1974. He has successfully built and managed his own private companies for more than 38 years. This provides Mr. Payne with years of experience in accounting, business leadership, and the legal aspects of governance. Over the last decade Mr. Payne has taken his natural networking skills and built on them to create strong team dynamics that lead to success and generate movement. With a strong leadership presence, Mr. Payne is leading dynaCERT in a way that has helped to streamline corporate activities, generate growth, form new partnerships, and bring the corporate vision to a reality. Mr. Colin is a corporate strategy consultant to high-growth publicly listed companies. He has been a recognized senior securities industry executive and effective investment banking professional providing financing and mergers and acquisitions services to numerous prosperous issuers in Canada. As a result of his extensive financial background throughout his career, he has been called to lead teams of corporate finance professionals at national securities dealers, such as Richardson Greenshields, JP Colin Securities, Deacon Capital, Octagon Capital and Desjardins. He has also served as a high-profile corporate board director and C-suite executive of numerous public companies, often chairing audit committees, compensation committees and corporate governance committees, including with Premier Gold Mines; Wolfden Resources, sold to Zinifex for over $350 million; Virginia Gold whose Eleonore property was sold to Goldcorp for over $ 1 billion; and, Pelangio Mines, the former controlling shareholder of Detour Gold, one of Canada's largest gold mining operations. Mr. Colin holds a DCS from McGill University where he studied Biology & Engineering, an MBA from the University of Western Ontario, a Law Degree from the University of Ottawa and also practiced corporate law prior to his investment-banking profession. Robert Maier is a Mechanical Engineer who has spent over 30 years building machinery and technology companies. He served as president of MKG Inc., Kaperal Corp, and Semco Technologies which are all Ontario Companies. He was also the COO of MTA, a coal-mining equipment manufacturer in Pittsburgh. In addition he has served as VP Manufacturing for Skyjack Inc. and VP and director for Puma Engineering. All these companies developed and manufactured technology locally and shipped the products worldwide. Since 2011 he has been the President of SPS North America. Mr. Ronald Perry has almost 30 years of accounting, financial and entrepreneurial business experience in high technology, venture capital and merchant banking companies. Since the year 2000, Mr. Perry has been the Founder and serves as President of Briolijor Corporation, a financial consulting company to both private and public corporations. Mr. Perry has been involved in all facets of business including statutory reporting, internal controls, legal aspects as well as all administrative responsibilities. Mr. Perry serves as a Director of Manitex Capital Inc. and Pinetree Capital Inc. Mr. Perry is a Chartered Accountant and holds a Bachelor of Commerce in Accounting from the Concordia University and Bachelor of Commerce in Administration from the Concordia University. As a Director with dynaCERT, Mr. Perry serves as the chair of the Audit Committee. Mr. Hoffman has served as a member of the Corporation's Business Advisory Committee since October 2007. He is a Chartered Accountant and business executive with one of America's finest companies, Deere & Company, a corporation that is customer driven and places a heavy emphasis on quality and teamwork. He served as Vice-President, Finance at John Deere Limited for 25 years and President of John Deere Credit for over 8 years. As well, Mr. Hoffman spent two years in Deere & Company�s Business Development Dept. responsible for mergers and acquisitions. In his public service, Mr. Hoffman is volunteering as Treasurer of Christians For Israel, Canada, responsible for Planning and Development. Richard has more than 25 years of global experience developing and implementing business strategies for organizations in North America, Europe and Asia. He has extensive experience in the energy industry. He was the President of Sky Solar (Canada) Ltd., and a Managing Director at Sky Solar Holdings Co., Ltd. Richard was the VP of Business Development at ARISE Technology Corporation, where he was instrumental in securing its long-term supply chain funding of close to $1 billion dollars. Richard also previously held the position of Chief Conservation Officer and VP of Toronto Hydro Corporation, where he developed and executed a sweeping portfolio ($110 million) of Conservation, Demand Management and Distributed Energy programs and was instrumental in creating an energy conservation culture in Ontario. Prior to that he was the Vice-President of Environment, Health and Safety, ensuring Toronto Hydro Corporation�s commitment to providing a safe and healthy workplace for employees and the strategies for achieving sustainable development and growth are successfully met. Richard has held senior positions with Enbridge Gas Distribution, Husky Injection Molding Systems Ltd., and Dillon Consulting. Dr. Elliot Strashin brings with him a wealth of experience across a number of industries. His involvement with public mining companies began with Maple Minerals Inc. from 1996 - 2001, where he served as a director. In April of 1999 he joined the board of Canadian Golden Dragon Resources Ltd. as Corporate Secretary and became President and CEO in January of 2000. He continues to serve Dragon under its new name, Trillium North Minerals Ltd., as CEO and President. Dr. Strashin is also CEO and President of Strashin and Sons Limited, a private real estate development company that specializes in LEED1 certified, green building. dynaCERT's plant and offices are located in one of these buildings. In keeping with his green focus, Dr. Strashin has also involved himself in green technologies as a co-founder of Ellsin Environmental Ltd., which has built a prototype tire recycling plant in Sault Saint Marie and is a wholly-owned subsidiary of Environmental Waste International Inc. He is also a 50% shareholder and Chief Financial Officer of Puma Hydrocarbons Inc., a company whose purpose is to promote and generate sales for green technologies, including dynaCERT products. Amir Farahi is a Government Relations and Public Affairs consultant. He is the Principal at Blackridge Strategy Inc. (�Blackridge�) one of the largest Government Relations firms in Southwestern Ontario. Blackridge has established a strong working relationship with all three levels of government in Canada, Federal, Provincial and Municipal, and has a solid track record with its clients in real estate, construction, labour, health care, and heavy industrial industries. Amir was a senior advisor to Fanshawe College and was instrumental on the establishment of its innovation centre which led to the creation of Fanshawe�s Innovation Village i4C Hub in Q4 2018. This is a one stop centralized shop that supports and provides services through the Centre for Research and Innovation, the Library research team, the Canadian Centre for Product Validation, Centre for Advanced Research in Biotechnology and LEAP junction to innovators on campus. Amir was a columnist for 3 years for Metroland Media Group, a subsidiary of TorStar Corporation and his columns were amongst the top read every year as ranked by the editorial team. He was a political commentator for Bell Media Inc. and has appeared regularly on Newstalk 1290 CJBK radio and CTV News in London. He was also Chair of the City of London�s Transportation Advisory Committee at a time when the City was planning a $500 million investment to implement Bus Rapid Transit. The project is part of the City�s 2030 Transportation Masterplan which is currently being implemented. Amir is the Executive Director of the London Institute, an organization that in partnership with Farhi Holdings Corporation, TechAlliance and London�s Small Business Centre, has planned a $31.5 million entrepreneurship centre, (180,000 square feet) the largest in Southwestern Ontario. The entrepreneurship centre�s services will be built around TechAlliance (Regional Innovation Centre) and the London Small Business Centre, who will both be moving into the building�s first floor to provide entrepreneurs with one-stop access to supports, services, and workshops. TechAlliance will house its Immersive Digital Experiences Accelerator (IDEA) providing incubation and acceleration for the next generation of local video game developers and BURST for high-potential medical technology startups and scale-ups that will position London as a focal point for life sciences innovation. BURST provides intensive support to 30 companies, including approximately $3 million in cash and in-kind support. Amir was also a Co-founder of FillSpaces Technologies Inc., which was a recipient of Ontario Centre of Excellence funding for its artificial intelligence and machine learning applications to its sales verticals and marketing channels. The company was funded by Western University�s business incubator (Propel) and accelerator. Amir has a Bachelor of Arts in Political Science from Western University. During his time at Western University, Amir founded the King�s University College Undergraduate Research Journal, a peer-reviewed publication by faculty showcasing four of the top research papers by students. Mr. Marrelli is a Chartered Professional Accountant (CPA, CA, CGA) and serves as Chief Financial Officer of a number of other Canadian public companies including some listed on the Toronto Venture Exchange and the Toronto Stock Exchange. The Company has also engaged Marrelli Support Services of Toronto, a company affiliated with Mr. Marrelli, to provide certain accounting services. Mr. Bridge has an extensive background in managing technology operations and multi-million dollar corporate ventures. He is an accomplished leader with extensive knowledge of restructuring and streamlining IT to increase efficiency and reduce cost. Mr. Bridge has held several senior IT positions with major firms for the past 25 years as well as successfully led teams at AMD, RBC Financials, Virgin Mobile and Blackberry. As the senior IT leader, he helped Virgin Mobile in Canada expand from a start-up to a key competitor in the Telecommunications sector. In his most recent position at Blackberry as a Director of Infrastructure, Architecture and Engineering, he led a high performance team that designed and supported large scale enterprise wide systems. Technology MarketWatch provides insight into growing and highly prospective technology companies, many which are so often overlooked/flying under the radar, and can provide exceptional potential to richly reward investors. The companies we select offer outstanding prospects and experienced management.